Aussie music legend Molly Meldrum has been honoured with a giant statue in his hometown of Melbourne. 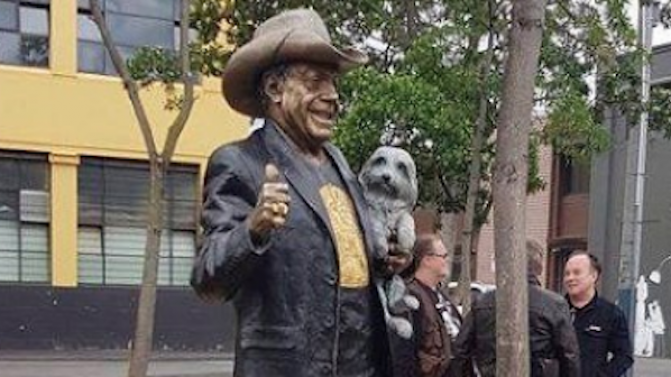 The iconic star of Australia’s Countdown has been immortalised forever in bronze, with the massive likeness depicting Meldrum wearing his trademark cowboy hat and holding his pet dog Ziggy, while flashing a cheeky grin and a thumbs up. Speaking with the ABC, the 75-year-old quipped that he’d tried to wriggle out of the project by telling sculptor Louis Lauman that he’d only agree to do it if he could pose with his dog. “I could barely believe it when they came back and said it’s going to happen,” Meldrum said at the official ribbon-cutting ceremony this morning. Witnesses report that the veteran star appeared close to tears as old friends such as TV host Eddie McGuire shared touching words in his honour. “We salute you today, my friend, and what an honour it is for all of us here today — each one of us has been inspired or touched by your wonderful work over the journey,” McGuire told the crowd. The statue, which was brainchild of Molly’s mate Ralph Carr and the City of Yarra, stands 1.8-metres tall and can be seen IRL right next to Richmond’s Corner Hotel in the Wangaratta Street Park, beside a new mural paying tribute to the live music industry by artist 23rd Key. 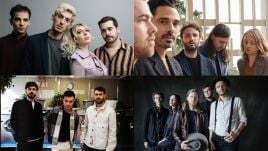 Check out some fan snaps that have already hit Instagram below.